I LOVE to shop! I truly get a high from being in the mall and buying things. In the past two years I have had to cut back BIG time on my shopping. I pretty much had a shopping addiction while I worked full time and lived at home for two years after college. I love all things designer ESPECIALLY HANDBAGS! Fortunately handbags always fit, even with fluctuations in weight! Since my cut back I really have been selective when buying anything new, it has to be something I will definitely wear and I must be getting some kind of discount! Plus I’m LAZY, so going to the mall has to be worth it for me. I absolutely hate shopping when it’s crowded, I prefer to go alone (unless I’m on a girls trip) and the best mall in Vegas has so many tourists, it gets super annoying! Being lazy I also prefer to map out my trip to go minimal distances and spend as little time as possible in the mall. So now to the point of this post: Birthday Month shopping! As an avid shopper I receive emails every day from different stores, as well as receive many coupons in the mail. Also when you have credit cards to certain stores they give you reward money and birthday money coupons. Since May is my birthday month, I received $10 off coupons from Victoria’s Secret and Express, plus $15 to the Limited. I also had recently earned a $20 Nordstrom Note and had a gift card to the mall for $25 leftover from Christmas. What to do with all these discounts?? WELL I had a plan!! Since I was limited on the weight for my luggage on this trip, I planned on dumping the warm weather clothes in Florida and having my mom mail them back to me (cheaper than checking another bag). Then I planned on replacing it with clothes I would need for the rest of my trip (like dress pants for company visits in Peru). Today I bought a pair of TOMS shoes! I had heard from my fav blogger ( PB Fingers ) how comfortable they were. I really wanted to try a pair on to see how they felt. I instantly fell in love with this pair! 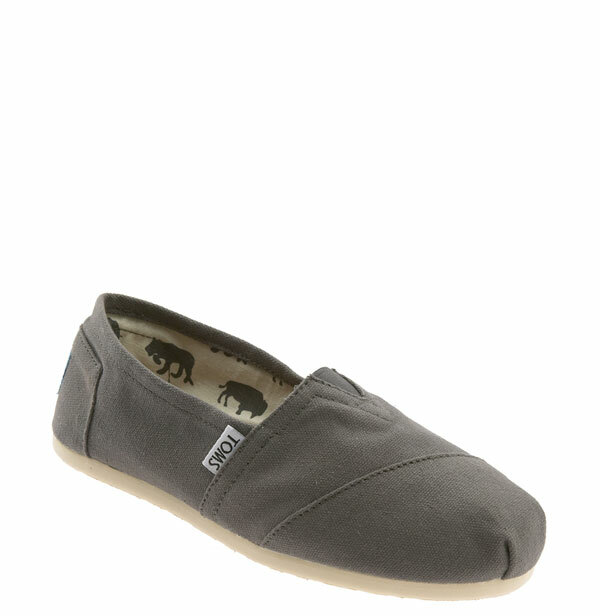 The ash grey is cute and neutral and they were so comfortable! I’m pretty sure I will wear them every day! I spent $1.59 on these shoes, since I used my nordstrom note and gift card! Next stop was Victoria’s Secret, I picked up a new bikini for my family bday celebration on Saturday and to bring along to Peru. I saved $20 with a birthday coupon and a $10 angels reward card. My favorite stop of the day was at Express. I had multiple coupons plus a $10 rewards card! I bought a pair of light gray editor pants and two shirts, I ended up paying less than full price for the pants and nothing for the shirts. I had coupons and birthday money to the Limited but didn’t find anything I needed. So that ended my actual shopping for the day, although I did plenty of window shopping! Save up coupons and rewards to use at once, just read the fine print to make sure you can use them at the same time! If you know you like something in a store and you know they have a sale coming up, or your birthday is the next month, if possible hold off buying until you get your birthday rewards! You still get what you want/need PLUS you save money (and if you’re lazy like me, less time you spend in the mall). I really have urges to go shopping, so to help curb that if one of my guy friends wants new clothes I offer to help pick out clothes with him. I still get the rush of shopping, without spending any of my own money! So offer to help your friends out, you get the shopping high and props for being a good friend!